The Evans (Instruments) Hess Screen has been re-designed to take up the minimum space, whilst not forgetting ease of operation. The screen is only approximately 25mm thick and houses 25 red light sources which can be individually illuminated by way of the operator’s control box, connected via a remote cable. 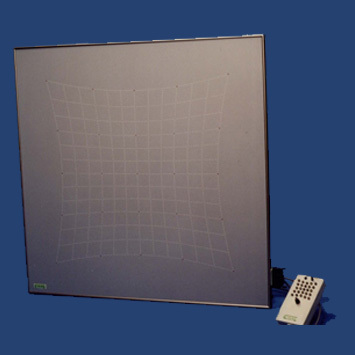 The wall-mounted screen is marked with a tangent scale covering 30 degrees in 5-degree steps, in each of the four directions of gaze. Dissociation is by use of a standard pair of Diplopia Goggles and the patient’s responses are confirmed by a torch producing a focusable arrowhead of green light. The new Evans UV Inspection Lamp incorporates an electronic starting system, providing instant start with no flicker. Significantly lighter in weight, the unit utilises both white and ultra violet light, which can be changed over at the flick of a switch. The switch is contained within the handle for ease of control and no warm up period is required. The lamp cover is made from flame retardant ABS, grained finish, making the unit both attractive and practical in use. 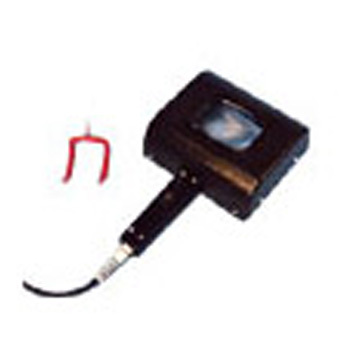 This new version is well balanced in use, with the choke unit located separately.